Gene Panzcenko and I used his documentary footage of the demolition of an historical structure in Peekskill to create a poignant condemnation of municipal mismanagement and political ineptitude. 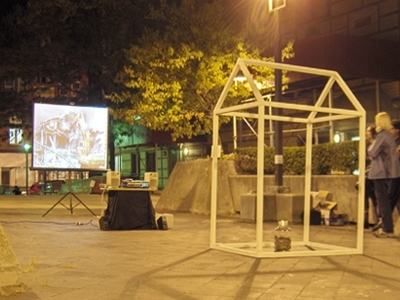 Gene built a skeletal version of the destroyed building, which we set up directly across from the site of the destruction. There, on a beautiful summer night, we presented the video in a free, public screening event.